Review: Popular: Vintage Wisdom for a Modern Geek ~ Love.Life.Read. “Popularity is more than books. It’s not clothes, hair or even possessions. When we let go of these labels, we see how flimsy and relative they actually are. Real popularity is kindness and acceptance. It is about who you are, and how you treat others” page 254. 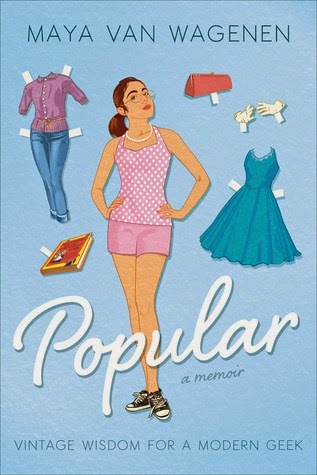 Maya sets out to follow Betty Cornell’s advice from her Teen-Age Popularity Guide during her eighth grade school year. Each month she follows a different set of advice from Cornell’s book, everything from dieting and posture to attitude. This memoir is often times hilarious, filled with trials and triumphs as Maya applies 1950's advice to her modern life in the twenty first century. Highly readable and enjoyable, this book resonates well with anyone who has felt left out and wishes they could feel different. I really enjoyed this title—I found the writing engaging and without pretense. The author was not afraid to mention her failures or times when her classmates said or did some things that are less than desirable. Considering Maya is only fifteen years old, I believe it adds to the authentic voice—it does not read nor feel like someone trying to write from the perspective of a young adult. The tone is heartfelt, wry and gut wrenchingly honest and it adds such a bright spot in young adult memoirs. Read-a-likes: I am blanking on one but the old television show Felicity kept jumping into my mind while reading it. I will be watching for works by her from years to come, Maya’s writing is a breath of fresh air. I loved this book and your review! Maya's voice (her trials and tribulations) was sincere, funny, and real. Like you, I am looking forward to reading more books written by Maya Van Wagenen!! !